Looking for just the right table to host your drink and phone as you enjoy your recliner? The Amish Royal Chairside Table is the one for the job. Offering versatile mission style with rows of perfect slats lining each side, there's a handy lower shelf, table top, and solid wood construction that makes one attractive presentation. 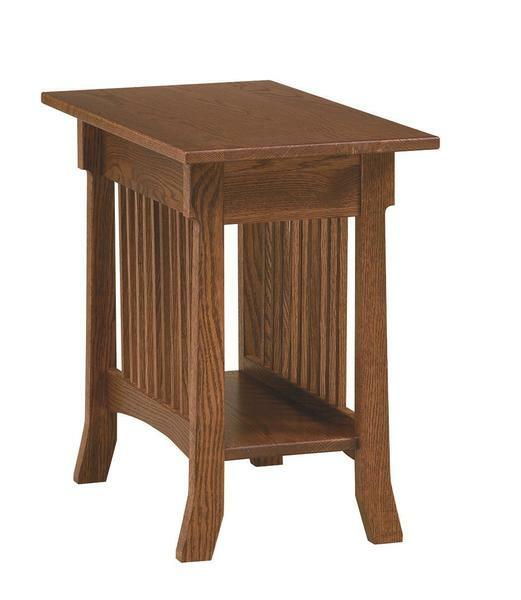 All of our Amish tables are built to last for generations. Amish furniture is durable and beautiful and you get to customize it to best fit your decor. Please email or call us today with any questions. Thank you for shopping with DutchCrafters.